Although the government claims Kala Dhaka, a semi tribal area, has been changed into a settled district and renamed as Tor Ghar in accordance with the wishes of local tribes, the new district is created to safeguard other parts of Khyber-Pakhtunkhwa (KP), especially strategically located Hazara Division, from militancy. Hazara division borders Islamabad, Gilgit-Baltistan in the north and Muzaffarabad in the east. The local militants had been using the semi-tribal area for carrying out terrorist activities. These militants had reportedly taken refuge in the area after fleeing the military operation in the Malakand division. On January 27, Kala Dhaka was officially declared the KP’s 25th district, changing its tribal status to a settled district, and renamed as Tor Ghar (the area’s historical Pashto name which means “black mountain’) during a ceremony at President’s House, Islamabad. Tor Ghar was previously a provincially-administered tribal area in Mansehra district which shares borders with Buner and Shangla districts of Malakand division and other areas of Hazara division. The Indus River separates Tor Ghar from Malakand division. 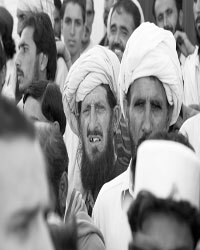 The area is inhabited by five main Pashtun tribes — Hassan Zai, Basi Khel, Aka Zai, Nusrat Khel and Mada Khel — and is governed through the centuries-old local jirga system. Following a military operation in the Malakand division, militants fled to tribal area of Kala Dhaka where the local militants, led by Momin Khan and Maulana Dost Muhammad, were already making inroads in the territory. Later, in neighbouring districts of Hazara division, especially in Mansehra, militants started their subversive activities and attacked the offices of international aid organisations and police stations. On March 9 last year, six people, including two women, were killed when the militants attacked the office of World Vision — an American aid organisation in tehsil Oghi. The militants had also attacked Mansehra and Balakot police stations on February 20 last year, killing a station house officer (SHO) and injuring nine cops. Although the responsibility for attacking the police stations was claimed by a newly-formed militant group “Jandul-Hifza”, local sources say these attacks were carried out by militants belonging either to “Lashkar-e-Ababeel”, a militant outfit headed by Mujahid Mahiyuddin or the Momin Khan-led militants operating in the semi-tribal area of Kala Dhaka. Similarly, on April 6, 2009, four people, including three female staffers of a USAID-funded project “Rise International”, were brutally killed by militants in Shinkiari area of the district. The militants operating in Kala Dhaka and Mansehra had been involved in Swat-like activities for the last three years and they had established camps across the hills of Chinikot and Pakal Valley in Mansehra. Several Kashmiri militant groups also ran eight training camps in Batrassi forests of Mansehra before 9/11 which were closed down later. The rising militant activities compelled the government to launch a military operation in the area. The local political administration contacted the elders of local grand jirga, comprising all five clans of the area, and formed armed lashkars (militias) to restrict infiltration of militants from Buner and Shangla. Momin Khan, belonging to Basi Khel clan, assured the jirga not to conduct any acts of violence. Demands of tribesmen included tax exemptions, arms licenses to legalise weapons, free health and education services and relaxation of educational qualification in appointments on government jobs. The tribal elder claimed KP Chief Minister Hoti had agreed to the conditions. Thanks for the wonderful article, Zia. I’m a Hassan Zai, and from this locality. Have you been to Tor Ghar? yes, Do u know Iqbal Zaib Hassan Zai, he is a good friend of mine.